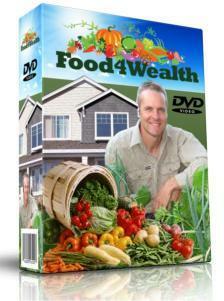 This week I had the opportunity to take a comprehensive look at 'Jonathan White's Food4Wealth system. The ebook which is part of the package is titled 'Everyone's Guide To Growing Food'. It is comprehensive and well laid out, and is written in simple terms that anyone can understand. It covers all aspects of growing and planting organic crops in a way that you probably would not have previously considered . It starts right from the design stage and goes so far as to choosing the best shape for your organic garden, yes it appears that even the shape can have an impact on how you carry on your gardening. How you can construct a productive garden, and the benefits of compost and the application, to provide you with the best crops in the minimal amount of space. Planting and propagating plants is covered quite extensively, showing how you can attain higher yields whilst at the same time eliminating weeds. Jonathan then goes on to offer valuable advice on seeds, which ones to save from existing plants and which ones you should purchase. This is an important section showing how serious savings can be made, particularly during the prevaling economic conditions. Seeds that are mentioned have been placed into three main categories open-pollinated and heirloom, hybridized and genetically modified. This is an interesting chapter, and I totally agree with Jonathan's viewpoint on GM foods and the likely impact they may have on our planet. This alone is worth the read. In addition to the ebook there is a project plan sheet showing setting up, maintenance, and a checklist so all the work has been done for you in this regard, all you have to do is to follow the plan. There is also more than a dozen videos covering all the important aspects of organic gardening, including the dimensions of your plot you will need, how to create a frame,composting, how to adapt an exisiting vegetable garden, planting a potato bed, and for those who love fruit an interesting way to produce upto 3 times more fruit even in areas that are limited for space. The Food4Wealth package is well thought out, and provides everything you need to know about growing organically grown food economically and efficiently even in a limited space. Recommended.